Kelly Swanson said ~ Thus far, this has to be my favorite story by this author yet. Navarre was so well-written. I pretty much ate this story up. Ashley created such an interesting world with her ancient religious cult and the unexpected turns in the plot made me fall in love with the story. I really enjoy it when an author transports me with her writing and Ashley definitely did this in the first half of this story. Though the "modern day" portion of the story didn’t make me fall in love as the first part did, it was no less entertaining and I really did like this story. 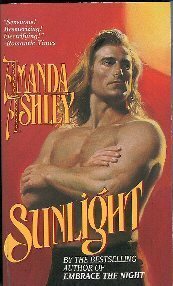 Ashley was the very first paranormal romance author I ever read, and specifically, the first vampire romance author. Thus, I feel a certain fondness for her novels. Besides that, I also like them because her love scenes are not very graphic, even though she writes for adults. I've noticed that Ashley's books are not mentioned often on PNR/UF book blogs. That's probably because they might seem outdated to certain readers, not only because of her more modest love scenes, but also because she references Christian themes in some of these books. it's unfortunate that her books are not given more recognition by PNR/UF readers, as her characters are usually compelling, and the romance very satisfying. However, I do remember reading some titles that I did not like at all. The quality of her books sometimes varies. This particular novella was very interesting, and I had to keep reading until the very end, finishing it in just a few hours one night. The plot was very original; at least, I've never read anything similar. The story of how Navarre (he has no last name) eventually becomes a vampire is unique indeed. After centuries of existence, he ends up in the fictional town of Moreno Bay, as an antiques dealer. There he meets Adrianna Grant, a very young bookstore owner in the town who has been searching for an antique oak armoire. As with every romance novel or novella, no matter what the sub-genre, it's very obvious here that these two will soon be romantically linked. But the fun of reading romance is not whether or not the main characters will become a couple, but how and when. From the beginning, there's an undeniable attraction between these two. Navarre has been alone for a very long time, as he is a sensitive soul, and it's too painful for him to become emotionally involved with mortals. As for vampires, they tend to be more solitary, so a relationship with a vampire woman is not really all that possible. There was one such woman in his past -- Shaylyn, his creator. However, she is totally predatory, with no compassion for humans, while Navarre, like Edward Cullen in the Twilight series, lives on the blood of animals. This novella was first published before that series, however. What I love about reading short romance works like this one is the intensity of the romance -- everything proceeds very fast, very urgently. Navarre and Adrianna share a very strong passion, yet Navarre is conflicted about becoming involved with her. He is not only afraid of hurting her, but also of how she will react once she knows his true nature. He lost someone he loved in the distant past, and never thought he would come to be in love again. His situation, while a bit melodramatic, is a poignant one. It was so sweet to read about his inner turmoil; it meant that he was at heart a good man. This novella makes perfect light reading. There are no sub-plots involved, and very few secondary characters. It focuses almost totally on the vampire and human couple, which, as I stated above, I thoroughly enjoyed. To me, it reflected the intensity of falling in love -- those heady, heart-pounding days when a woman realizes that the overwhelming attraction she feels for a man she's recently met and started dating has shifted into something deeper and totally exhilarating. It's been a while since I've read an Ashley novel. I think it's about time I checked out her more recent ones, fully plunging into her vampire world again! Amanda is an astounding Author. I have read her books for years. She did not disappoint me with “Moonlight.” I was caught in the first two sentences, I had to know more and the more I did come to know made me cry through the entirety of Part One. Not just a few tears rolling down my cheek but sobs that shook my shoulders. You will need a box of tissues or a tear towel. Everything within the storyline and plot was unique and original. I say that with the knowledge of reading close to 2000 books and never coming across this type of storyline. The first chapter absolutely sets the story. Amanda has such a clear direction of where she is taking this story. I know I said I loved it and I did, but I HATE to cry to the extent of sobbing. It's that great. Navarre, born in a caged room, with his mother with him for only twelve years. One day he wakes up and she is gone, never to see her again. Navarre spends the next twelve years totally alone – no one to see him – no one to speak to him, only a guard to bring him two meals a day and allow him one bath a week. Navarre knew what was going to happen to him in one year. He would die as his father before him, his grandfather before him and his great-grandfather before him and the rest of the men before him. Navarre knew exactly what was going to happen to him and how it was going to happen. It's utterly amazing how Amanda set the storyline up. In the past I’ve read about werewolves and vampires. In this story I was amazed at how unique each aspect was and how the story built. The characters were so right for their part in the book. I certainly couldn't nor wouldn't have changed a thing about them. The day of Navarre's 24th year he was brought a virgin mate to conceive a male child to become the new sacrifice in another 25 years. As Navarre would be when his child was born. As Navarre was taken for sacrifice the Goddess decided not to kill him but to give him the “Dark Gift” of becoming immortal. Skip ahead 2000 years and Navarre is content at this time. But it hasn't always been so. Navarre has found himself drawn to a woman, Annie, and she is drawn to him but he can't risk it. He might hurt her. This story has pulled on so many of my heart strings but when I was done I couldn't get over how great “Moonlight” was. He had spent his whole life in a cage. As a child, he hadn't questioned it, it was simply the way things were, the way they had always been. He had learned to crawl, then walk, then run, on the hard cold stones. In truth, it wasn't a cage at all, but a large square room made entirely of rough-hewn gray stone except for the door, which was built of wood reinforced with thick iron straps. There were two beds, two chairs, a table, a shelf filled with scrolls that contained the learning of the Kenn - scrolls that were changed each year. A single, iron-barred window was set high in the east wall. The days passed slowly. His mother, Isobele, read to him for hours at a time. She was the center of his world, his life. He had no contact with any one else save the guards who brought them food and water. The guards never spoke to Navarre, never made eye contact with him. Only on rare occasions did they speak to his mother. As Navarre grew older, Isobele taught him to read and write and cipher. Once, he heard her mutter something under her breath, something about it being a waste of time to teach him to read and learn his numbers. "Why, mother?" he had asked. "Why is it a waste of time to teach me these things?" She had knelt down to face him, her expression filled with kindness. "What do you mean, Navarre?" "I heard what you said. Why is it a waste of time for me to learn to read, to write?" "You did!" He had stared at her, wondering why she was lying to him. She had never lied to him before. "No, Navarre," she had insisted, not meeting his eyes, "you must have misunderstood me." He hadn't argued with her, but later that night, when she thought he was asleep, he had seen her standing at the window, the moonlight casting silver highlights in her long blond hair. The sound of her muffled sobs had brought tears to his eyes. Sometimes she held him up to the window so he could look out. As a child, he had spent hours imagining what it would be like to run through the tall grass, climb the trees, play in the clear blue river. Far in the distance, like a castle in a fairy tale, stood a gold-domed building made of sparkling white stone known an Stone Hall Keep. Sometimes men clothed in long gray robes came to the window to stare in at Navarre, their pale blue eyes filled with curiosity and a strange kind of awe that bordered on fear. "Why do they look at me like that?" he asked one day. "They stare at you because you're such a handsome boy," Isobele replied. She turned her head, but not before he saw that there were tears in her eyes again. "Oh, yes," Isobele said. "You look just like your father." "Father?" Navarre knew what a father was, of course, from the scrolls he had read. But he had never realized he had one. Isobele nodded. "He was a very handsome man, your father. He had blue-black hair, just like yours. And his eyes were the same shade of smoky gray. You'll be tall, just as he was," she said. "Where is my father? What was his name?" "Your father is dead," Isobele said. She took a deep breath. "You are named after him." She nodded, a faraway look in her eyes. "How did my father die?" Isobele felt the color drain from her face. She had always known she would have to answer his question one day, but, even so, she was not prepared. How did one tell a child that his father had been sacrificed to a heathen god? How could she tell her son that he was destined to meet the same cruel fate? "Mother?" He looked at her through eyes far older than his years as he waited for her answer. "Do we have to speak of it now?" Isobele asked. She glanced out the window. "Look, the vixen is outside, playing with her babes." "He was sacrificed to the goddess Shaylyn." Navarre frowned. "Sacrificed? I don't understand." "Please, Navarre," she pleaded. "Let us not speak of it now." "When you have seen thirteen summers." Another year, he thought. Certainly he could wait another year. In the meantime, there were other questions crowding his mind, questions he had never considered before. It was as if his first query had unleased an avalanche. "Why do we live in this place? Why can't I go outside?" Suddenly restless, he began to pace the room. "Where do those other people live, the ones who come to stare at me?" He glanced down at his hands. "Why is their skin so light when ours is dark? How long will we have to stay here?" He looked at his mother, eager for answers, only to find her staring at him, her face drained of color, her dark blue eyes filled with sorrow that seemed to have no end and no beginning. "I'm sorry, Navarre," she murmured, her voice thick. "So sorry. I didn't want this for you. I tried to kill myself, but they stopped me. Your father..." She took a deep breath. "He tried not to touch me, but they drugged him..."
Isobele fell to her knees before her son. Her hands shook as she clasped his. "Forgive me, Navarre, please forgive me." He was looking down at her, looking at her through eyes exactly like his father's. How could she explain? How could she make him understand? "We're kept in this place because we're prisoners, Navarre. Your father was born here, just as his father before him, and his father before that." "Were you born here, too?" "No." She released Navarre's hands and sank back on her heels, her thoughts turned inward. "I was kidnapped by the Kenn when I was sixteen. We were imprisoned until the day of your birth, and then your father was taken to the Temple of Shaylyn and sacrificed to the goddess." Isobele closed her eyes, the memories she had sought to keep at bay flooding her mind as she related the story to her son. It was the way of the Kenn, to sacrifice a living male to the goddess Shaylyn every five and twenty years in the belief that such a sacrifice would insure the goddess' continued benevolence, but the sacrifice must be a man who had proven his virility by siring a male child. Since time out of mind, the Kenn had raised men who were destined to be sacrificed. Men who were pure in heart and mind and body because they were never exposed to evil. For a year, she had been locked in a cage across from Navarre's father. They had been able to see each other, to speak to each other, but never allowed to touch, until the year he was four and twenty. Aware of what the future held for him and any child he sired, Navarre had refused to bed Isobele, but the priests of Shaylyn had drugged him with a powerful aphrodisiac. She had been horrified when they brought him to her. His deep gray eyes had been glazed with lust, his body ready. She had been frightened of him then. That night, he had not been the gentle man she had grown to love, but a stranger, a man who had no regard for her virginity, no thought at all save to appease his drug-induced lust. Her protests had fallen on deaf ears, and he had possessed her over and over again, every night for the next fortnight, until his seed had taken root, and then she had been taken away, never to see him again. He had been sacrificed to the goddess the morning after their son was born. And now his son was destined to meet the same fate. When Navarre became of age, he would be mated to a virgin and then, when his son was safely born, Navarre would be sacrificed to the goddess Shaylyn. Isobele opened her eyes to find her son staring down at her, a look of horrified disbelief on his face. "They are going to sacrifice me, too, aren't they?" She couldn't say the words, but he read the truth in her eyes. "How?" he asked. "What manner of sacrifice is it?" Isobele shook her head. "I know not, Navarre. All I know is that they took me away and I never saw him again." Navarre thought of what his mother had told him all night long, more and more questions crowding his mind. But he had no chance to ask them. The next morning, when he woke, his mother was gone, and he was alone in the cage.